So lets talk about eating people. It’s not something we do. In fact the practice is very much frowned upon within polite company. Yet it’s still a fascinating concept. “Killing and eating someone is the height of depravity!” we yell, and then feel a little guilty when watching NBC’s Hannibal makes us hungry, (seriously the meals Hannibal cooks up look delicious). Society will at times overlook the practice of consuming the long pork. When survival hinges on overcoming the fact that what people are tucking into used to be happy go lucky John Smith, who never had a bad word to say about anyone. So what about when society crumbles and the last vestiges of civilisation vanish in a radioactive fog? Well if Fallout 3 is anything to go by, it still makes you a horrible person, and that really makes no sense. Consider this. The world of Fallout 3 is an irradiated hell-scape crawling with bandits, killer robots and mutated monstrosities. Agriculture is a long distant memory. One does not generally grow crops in the capital wasteland. Any that do spring forth are most likely pillaged. Food comes in animal meats and tinned goods from before the war. Neither are particularly plentiful. 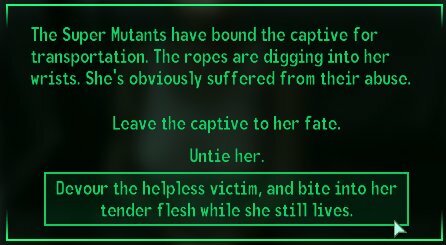 I am convinced cannibalism, or anthropophagy (humans eating humans) if you want to use the correct term, would be rife, not only among the murderous raiders, but by travellers, townsfolk and your ordinary everyday Wastelander. You automatically lose karma when you take part in the action, because we as players and the developers view the consumption of human flesh to be taboo. Yet it fails to take into account the situation which the player character finds themselves in. Cannibalism, history assures us was a relatively rare occurrence. We know the popular cases in which it occurred, be it the Donner Party in the winter of 1846-1847 and the 1972 Andes plane disaster. Yet as Petrinovich argues in his book The Cannibal Within, people eating each other happened all the time. This mostly applied to the survivors of shipwrecks. It had been the custom of the sea for survivors to consume the flesh of those who died, as the necessity of survival overruled any moral judgements. It was not until R v Dudley Stephensin 1884 that necessity was rejected as a viable defence for murder. This was a case in which the crew drew lots to decide who would be sacrificed for the greater good. The British public was said to be quite sympathetic to castaways at this time. Suddenly the act of cannibalism was seen as something less than human, because of racism, naturally. In a way this sense of moral righteousness still pervades how we view our media. In losing karma for the simple act of eating, Fallout 3 is saying that we are participating in a ghastly ritual that goes against the laws of nature. That we have become animalistic. Less than human. In a sense those age old racist connotations still apply. Even though as Nicholls points out, the human consumption of human flesh is as old as mankind itself. Who exactly is judging the player within the game. Is a nuclear apocalypse not classed as an extreme situation? In the towns where there is a thin allure of law and order perhaps cannibalism would be banned. You wouldn’t make the best first impression walking into Megaton happily chomping on an arm. But out in the wilds where resources are few and far between, who is judging you, the murderous raiders? Consider who the player is for a moment. They were raised in a vault and guns down anyone who gets in their way (usually). He has no connection to the people of the Wasteland, and would probably have to resort to cannibalism when they discovered their survival skills weren’t up to scratch. Empathy is generally the biggest hurdle to jump. In the Andes disaster the pilots were eaten first. One, they had an association of guilt for the plane crash and two, they were seen as outsiders, apart from the social group of passengers. In other instances it is recorded that foreigners are most at risk of being consumed by the larger racial demographic, because the human mind is a terrible, terrible thing. You can put a grenade in someone’s pocket and be rewarded, but god forbid you have a nibble on someone’s fingers. What are you, a savage?